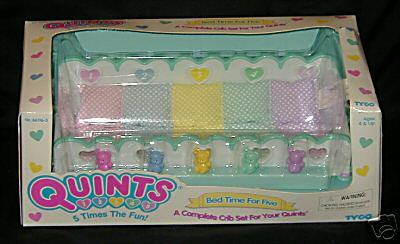 --"A Complete Tub Just for your Quints"
--"A Complete Crib Set Just for your Quints"
--A Rocking Cradle For Your Quints™ --With rocking cradle for 5, 5 blankets, 5 mobiles and 5 soft fuzzy bunnies. 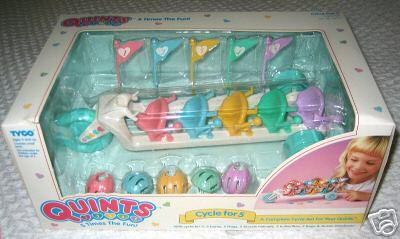 --A Complete Cycle Just for your Quints --With cycle for 5, 5 horns, 5 flags, 5 bicycle helmets, 3 butterflies, 2 frogs & Quints Storybook! 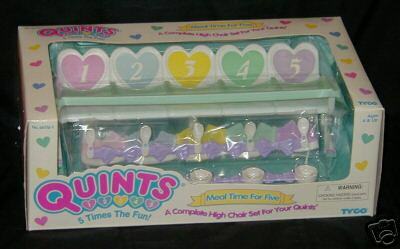 --"A Complete High Chair Set for your Quints" --With high chair for 5, bowl for 5, spoon for 5 and bib for 5! 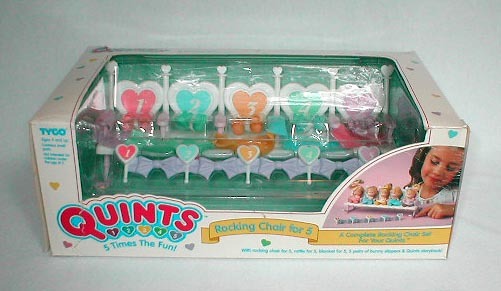 --A Complete Rocking Chair Set for your Quints --With rocking chair for 5, rattle for 5, blanket for 5, 5 pairs of bunny slippers & Quints storybook! 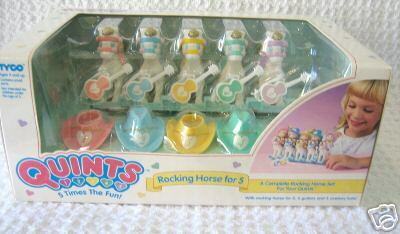 --"A Delightful Swing Set for Your Quints" --With teether for 5, 5 rolypoly toys and 5 sets of blocks! 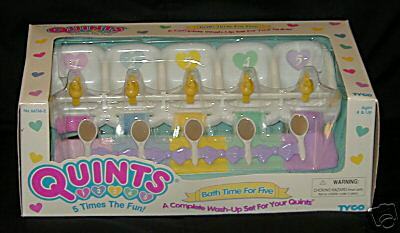 --A Complete Hair Care Set For Your Quints --"With Vanity for 5, 5 stools, 5 brushes, ribbons, headbands, combs, hair dryer & Quints Storybook. 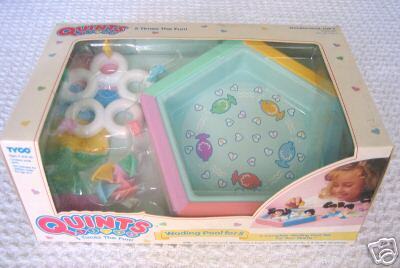 Wading Pool for 5 --A Complete Wading Pool Set For Your Quints --With special for 5 pool, special for 5 float, 5 sailboats, towel for 5 & Quints storybook. 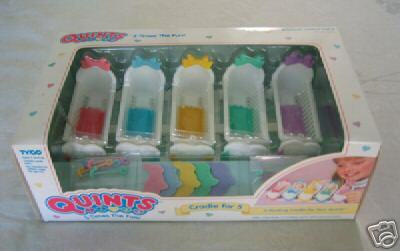 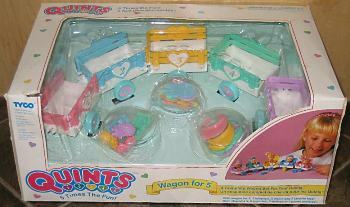 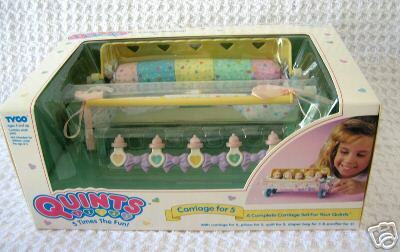 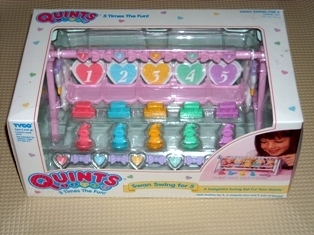 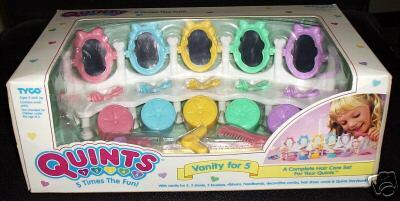 --A Complete Wagon Set For Your Quints --With wagon for 5, 5 lollipops, 5 visors, and 5 favorite toys.